Plus, the quick style lessons we learned from each one! At the end of a long day, there’s nothing quite like coming home and sinking into the sofa in front of the TV. Add in the comfort of a well-styled seating solution, a textured landing pad underneath, and a curated coffee table, filled with the essentials, and you have the ultimate spot for some well-deserved R&R. Living rooms are one of the few versatile areas of a home—one’s intended purpose can range from a relaxing oasis to a gathering spot when entertaining. When it comes to decorating a living room, comfort is key and maintaining an aesthetic that fits your style and needs come in at a close second. With that in mind, we rounded up the rooms that manage to seamlessly blur the line between form and function, resulting in a beautifully-decked space we wish we could call our own. Take a look. If you ever thought that there is such a thing as having too many patterns in a room, Kim West’s Austin home is here to prove you wrong. The trick? Working with a slightly monochromatic palette and sticking to a reserved color scheme of complementary hues. In West’s case, vivid blues combine with soft neutrals, resulting in a serene finish where a diverse slew of patterns take the lead. If you find yourself in need of a drastic change, might we suggest an alluring new shade for the walls? 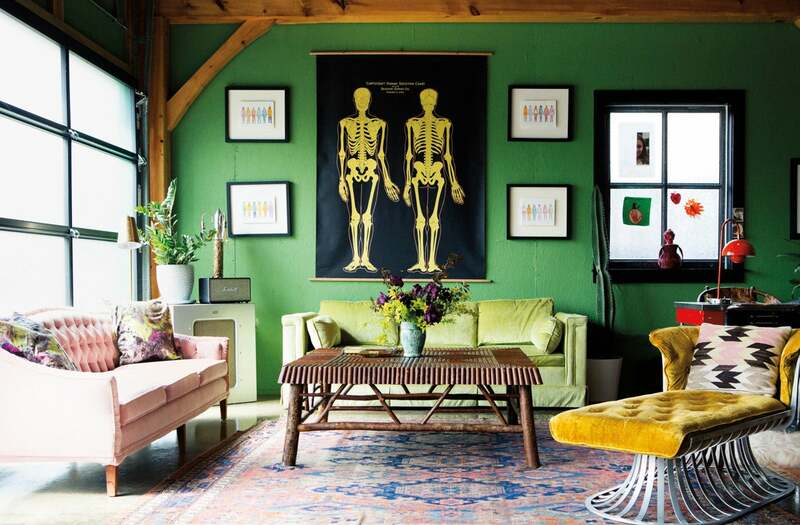 Take this color-charged Nashville living room for example, where the bright green backdrop sets the tone for the equally saturated furnishings and wall art that completes the vintage-inspired scheme of the space. Textured accents by way of the velvet upholstery and wooden coffee table complete the scene with a touch of depth and character. Painting the walls of your living room in a vibrant tone is great and all but giving the ceilings some decorative love never hurt either. Subtly is key here, no need to go all out. Just take a cue from this captivating living room, where an eclectic dose of color and modern elements combine with effortless ease, resulting in a space that is chock full of inspired moments and Pin-worthy vignettes. Leave it to this eclectic London home to give us the nudge to embrace a sofa clad in such a daring hue. Paired with an equally vibrant and eye-catching rug, the saturated details of the furnishings instantly draw the eye away from the whitewashed backdrop of the room. Keren Craig’s upstate New York farmhouse is giving us all the feels. From the mix of Moroccan-style poufs to the Turkish pillows and vibrant, woven textiles, there is a whole lot more than meets the eye in this minimalist living room. Coupled with the elegance of the English roll arm sofa, the space exudes pure comfort and effortless style. Worldly textiles, saturated hues, and with no shortage of inspired details, this Brooklyn-based row house boasts one seriously stunning living room. Note how an understated palette of muted paints establish the backdrop for the intricate characteristics of the furnishings—allotting the latter a more accentuated detail. Who could guess that this beautifully designed spot belongs in an NYC high-rise? Boasting elements of Danish design, the clear stand-out moment of this living room is the blush-toned sectional, which so effortlessly envelopes the room with its luxuriously elegant and contemporary qualities. Whitewashed walls, oak wood flooring, and a handful of greens complete the scene. Emmanuel de Bayser’s Berlin apartment boasts no shortage of inspired details and artistic elements. While the seemingly minimalist space may appear to lack a defined color element, we find personality through the various abstract furnishings that come riddled with modern characteristics. Channeling a recent Grecian getaway, Daphne Javitch incorporated the light and airy elements of the Aegan islands into the decor of her Lower East Side apartment. The (almost) exclusively whitewashed space boasts a hint of organic color via the wooden accents of the ceiling, flooring, and sofa. An array of subtle textural details further elevate the dynamic design of the muted space. A rustic space with a saturated pop of color still stands in as an instant classic—especially if said place comes situated in the English countryside. In this Georgian home, a damask-patterned, vintage sofa lends an enveloping element of color and character to the understated surround, unifying the overarching scheme of the home. On the opposite end of the spectrum, a saturated scene makes a strong case for decorating with the warmer tones. Furnishings appropriately clad in a delicate velvet – naturally complementing the hues – sit against a marsala-esque backdrop, proving that the subtle variations between the colors can exist in decorative harmony. It comes as no surprise that this immaculately designed spot belongs to Reed Krakoff. The stone mantel fireplace comes paired with a reserved decor aesthetic that allows for the signature elements of the room to really shine. At the top of our decorating bucket list: a monochrome design scheme that comes in an unexpected shade. Here, a deep sea blue extends from the walls to the focal furnishings, complemented by the depth of the eucalyptus strands, and subtly contrasted by the warm wood details. For those in need of a final nudge towards a more daring design, consider this it. Decorating with neutrals does not always entail a snoozy finish. Incorporate warm accents – in the form of woven floor pieces or saturated accent walls – to impart the decor with depth and a dynamic layer. We’ve got our eyes on the dusty rose, built-in bookshelf display, which manages to extend an effortlessly chic element to its surround. Is it just us or are farmhouses having a moment? Leanne Ford’s 1945 home transformed into a whitewashed dream space complete with a diverse set of textures and wow-worthy design moments. Consider the space a lesson in successfully decorating with an exclusively all-white scheme. Cement tiles may be a given for the kitchen or bath, but when it comes to the living room, it’s hard to resist the hardwood and area rug pairing. Though we must admit, this colorful display has us seriously reconsidering. Paired with an equally alluring wall paint and a modern assortment of complementarily-toned furnishings, this mod space is one for the books. Get the scoop on cement tiles here! Within this cozy cottage, a generous mix of textures help elevate the neutral design scheme, accentuating the bold details of the decor, which would have otherwise gone unnoticed. Note the subtle color variations of the layered sofa, which effortlessly complement the streamlined composition of the piece. A living room paired with an at-home library is always at the top of our decorative wish list – especially one that comes with an appropriately moody aesthetic. Note how the wall paint extends exclusively throughout the room, accentuated by the natural light for a dynamic finish. An unexpected pop of red presents itself within the exotically-inspired area rug, while a curated selection of found objects, books, and tropical greens bring about an elevated feel. Major cozy points for this one! No rustic fireplace would be complete sans a bundle of firewood and an equally inviting spot to sink into, nearby. This whitewashed space counterbalances the sterility of the decor with woven accents, pops of color, and an eclectic display of handcrafted finds. Minimalism is much more easily carried out when working with a room that comes with a solid foundation. Intricate moldings and ornately-detailed ceilings fit the bill. In this whitewashed, Parisian living room, the absence of color is assuaged by the ultra mod furnishings and rather impressive architectural backbones. When it comes to decorating our living rooms with color and pattern in mind, we’re taking major cues from this hotel lobby. Belonging to none other than the always on-trend Ace Hotel in Panama, this curated living space manages to touch on all the pillars of a successfully decked area: cozy textures, a complementary blend of vibrant colors, and plenty of patterns to mix and match! Who said gallery walls were out? If anything, we’re craving the trend bigger and better in form – preferably when it has the ability to take up the entirety of a living room wall. We’d like to think of the outdoor living space as a spot to let our decorative minds free. Though somewhat restricted by weather-friendly furnishings, the opportunity presents itself in sourcing style-focused finds with edge. This ultra mod setup does just that. A monochromatic assortment of pendants steal the spotlight, complemented by the streamlined furnishings and sleek, matte black accents. A juxtaposition of building materials contribute to the eclectic feel of this vibrantly decorated living room. A medley of textures and bold prints, bring about a colorful layer to the natural details of the wood and exposed brick fireplace. Tour the rest of this dreamy, beach escape. This Spanish farmhouse-inspired home boasts all the makings for comfortable outdoor living. Rustic textures come paired with modern accents, resulting in a modestly eclectic space that makes the best of its island setting. This story was originally published on January 2017, it has been updated.